AJ Fernandez has become well-known with enthusiasts over the years for his innate ability to craft bold and full-flavored smoking experiences, while managing to retain affordable prices. Because of this, his blends are some of the most popular choices for “daily smokes”. 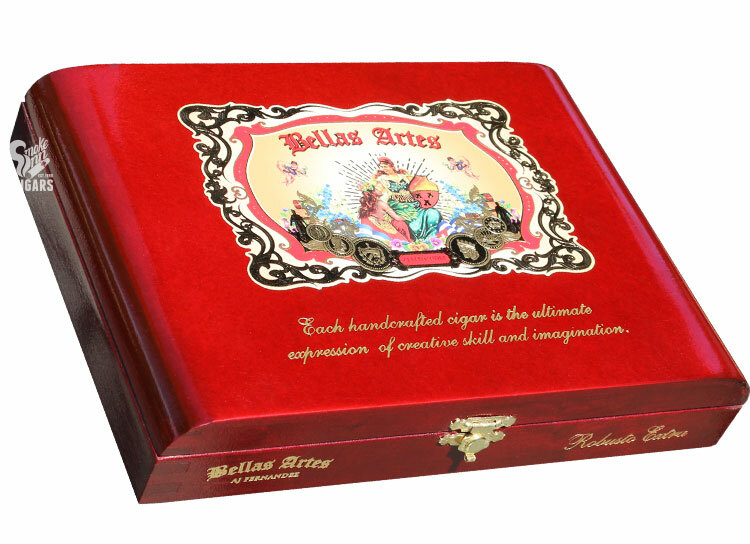 But with the brand’s latest offering, Bellas Artes, fans will be stocking up on the cigars for a different reason: because this is one of the most FULL flavored smoking experiences you’ll ever find! Bellas Artes translates to mean “Fine Arts” in Spanish - appropriately fitting this artfully blended masterpiece. The cigars incorporate a classic, “old world” look and feel, but it’s the blend that deserves recognition. Using a proprietary wrapper, AJ has managed to combine tobacco strains of 3 seeds, making for a completely unique wrapper known as “Rojita”. This, combined with a diverse blend of Nicaraguan, Honduran, and Brazilian filler tobaccos, makes for an unbelievably flavorful treat - filled with big flavors and a remarkably long finish! Notes of buttery crackers, citrus, light pepper, and sweet honey will have you “chain smoking” through your supply… we recommend stocking up preemptively.